Adopt-a-Highway Volunteers: Pat Nagler, Clayton Nagler, Fred and Nancy Kanter, Wayne and Vicky Head, Kenleigh Head, Tom Ronayne, Colleen Rocco, Ana Pogue, Ken Wright, George Zwicker, Mike Goodson, Nick and Barbara Fratila and mascot Hershey the dog. 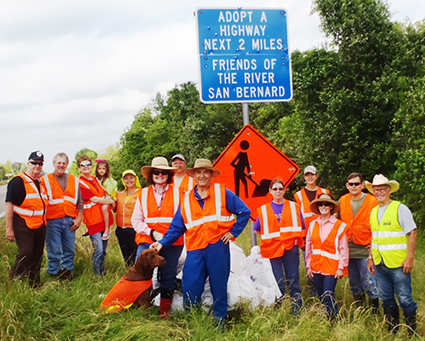 A record number of Adopt-a-Highway volunteers collected litter along FM 2611, near the Churchill Bridge on April 14, 2012. Fifteen people collected twenty bags of trash in an hour and a half. Trash collected included beer cans, soft drink cans, fast food packages, cigarette lighters, cigarette packs, car parts, a corrugated panel and a tiny pink Converse sneaker. Volunteer efforts reduce litter cleanup costs and save taxpayer's money. Thanks to all who worked to keep the San Bernard looking beautiful!